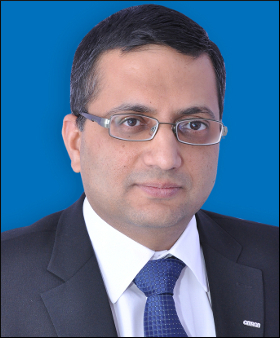 Industrial Automation is the 'life-force' of a manufacturing establishment, said Sameer Gandhi, MD, Omron Automation, India. "Industrial Automation is like an 'essential nutrient' or we can term it as the 'life-force' of a manufacturing establishment. Every manufacturing set-up strives to become more smart, more efficient, safe for their workforce and nimble to quickly respond to market changes as it evolves from a small scale to a medium scale to a large enterprise. Automation is the force that makes this possible," Gandhi told SME Times in an email interview. Sameer Gandhi: Omron Automation supports manufacturing excellence worldwide with innovative 'sensing & control +think' technologies in the automation domain. Being present in India for over two decades now, we cater to various industrial segments – mainly but not limited to packaging, automotive, material handling, solar, food & beverages, textile, panel building solutions and infrastructure solutions. Today, we have around 200,000 SKUs and around 30,000 variants in our portfolio - spread across Industrial components, automation systems, sensing & safety, motion & drives, robotics, software, etc. It has been helping manufacturers in the form of enhancing efficiency, productivity, flexibility, accuracy and safety as they scale up the value chain. Recently, we have also introduced the futuristic concept of IoT (Internet of Things) to expand their horizon and help them develop smarter machines based on the concept of 'i 3' – Integrated, Intelligent and Interactive. What type of prospects you see in the Indian market? Sameer Gandhi: Indian market is one of the promising target areas for Omron Automation across the globe substantiated by many factors such as – it is the fastest growing economy, has immense demographic dividend, a large base of young population, a large & growing middle-class segment coupled with massive urbanization. The industrial automation market has been witnessing a considerable growth over the last few years fuelled by many macro and micro level factors such as growing population, disposable incomes, ever increasing need of complying to global standards, the constant need for improving operational excellence at best ROI, desire for zero-defects, productivity & quality improvement , etc. As per varied market reports, the automation market in India is expected to have a CAGR of 10-12% during 2015-2020. Manufacturing as a field per se, is gaining lot of attention in the country majorly owing to the massive campaigns like Make in India, Skill India, Digital India, Start Up India. We visualise ourselves as 'enablers of Make in India' as this strategy has a direct correlation with the manufacturing sector which is our key target area. How automation can help companies in terms of efficiency and cost reduction? Sameer Gandhi: Industrial Automation is like an 'essential nutrient' or we can term it as the 'life-force' of a manufacturing establishment. Every manufacturing set-up strives to become more smart, more efficient, safe for their workforce and nimble to quickly respond to market changes as it evolves from a small scale to a medium scale to a large enterprise. Automation is the force that makes this possible. It makes them move up the value chain and enhance their level of global competitiveness in terms of productivity, efficiency, quality, speed, safety, and many other factors which they wish to significantly improve in their manufacturing set-up. What about affordability when it comes to the SME sector? Sameer Gandhi: Affordability is a concern with SMEs as they perceive automation as a cost. It is an investment, however, one must understand that it also has a carefully planned long term RoI which is necessary for them to evolve into to a smart large enterprise. It may not be possible to ignore the criticality of the quantum of investments. However, it is possible to optimise the same by planning better in the initial phase, investing in automation that supports open protocols, and by choosing the latest technologies. Can industrial automation empower an enterprise with competitive edge in the global market? Sameer Gandhi: Yes, it does. This is what its role is as explained earlier. Sameer Gandhi: As a company, we are constantly innovating, and striving to come out with more value-added propositions and solutions. We have many product launches lined up for this year which will pave way for the planning for the next year. We see ourselves as playing a much bigger role in enabling the manufacturers make in India and enhancing the pool of skills and talent in the automation industry.